The above addresses the swing potential of the front leg, but there’s something else in the front end that determines all the rest, specifically the style of the horse’s movement; daisy cutter or high knee action and everything in between. Even the horse’s front end lateral movement comes from this: the length and orientation to the horizon of the humerus bone. The humerus is attached to the scapula at the point of shoulder by a ball and socket joint giving the humerus bone forward and back motion as well as side to side motion. At the other end the humerus joins the radius-ulna (forearm) bone creating the elbow joint. 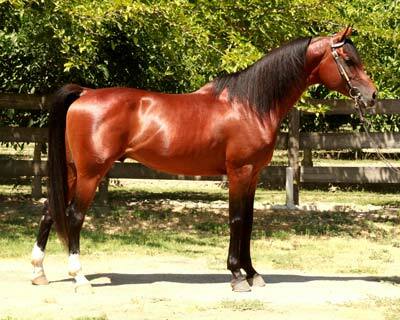 Gaited horses that are prized for their high knee action would thusly possess a long humerus bone orientated more vertically and likely also possess a quite open shoulder angle, well exceeding 90 degrees. 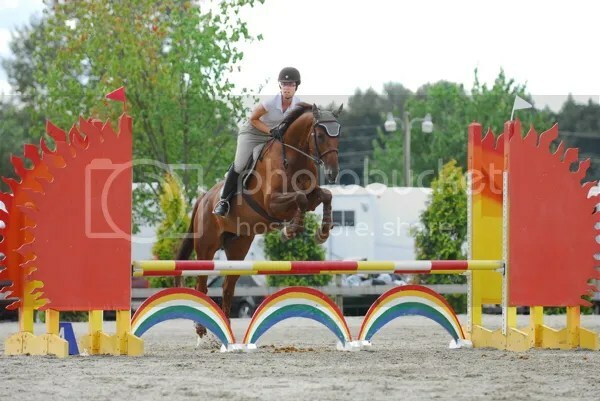 This would be the same for a Jumper that could put his knees to his ears with the exception of the placement of his knees being lower by having a shorter cannon bone; a requirement to stay sound from repeated landing concussion. The Dressage horse will also possess a long humerus bone, but less vertical compared to the gaited or jumping horse and in most cases not as open a shoulder angle, but certainly still maintaining the minimum 90 degrees. The shoulder slope of the Dressage horse will tend to be more laid back than the jumper. 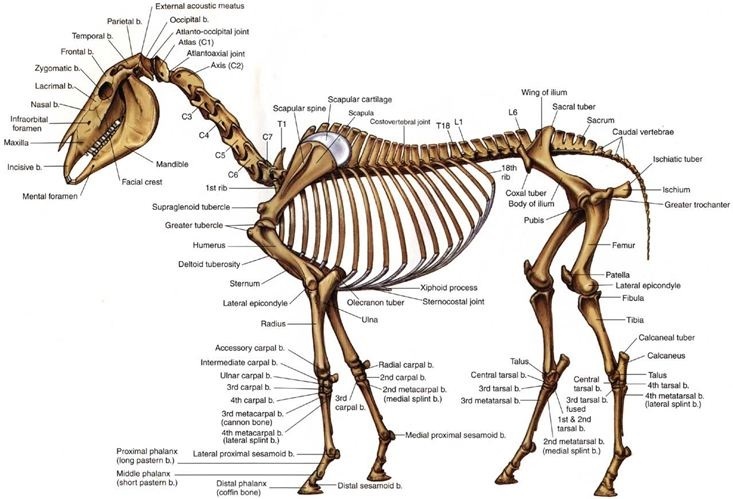 The Hunter horse with a long, sweeping, and low daisy cutting action will also have a long humerus bone, but it will lie more horizontal limiting the ability of the knee to be raised. The stilted front end gait of many Western horses is due to a closed shoulder angle and/or a shorter humerus bone set horizontally. 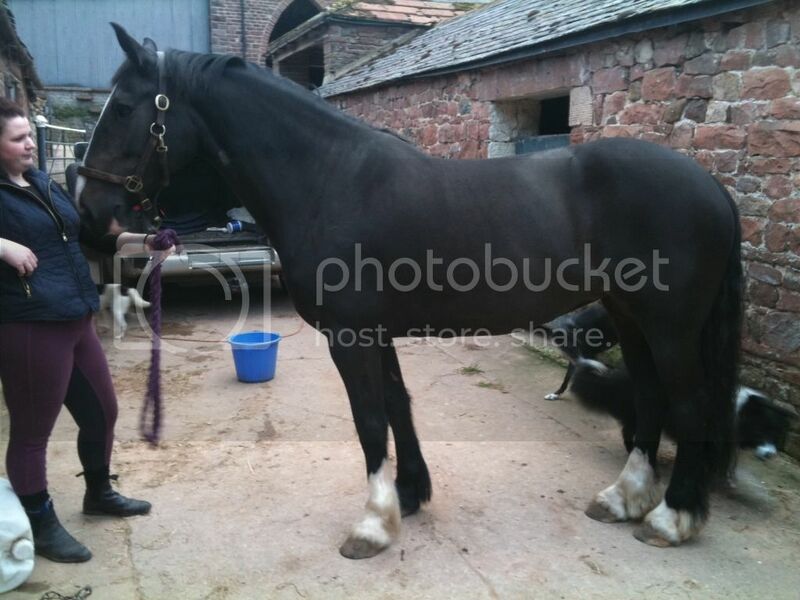 Our QH stallion has very good length to his humerus bone at approximately 64%. This trait helps to minimize the effects of his slightly closed shoulder angle. The humerus more on a horizontal orientation giving flat movement. 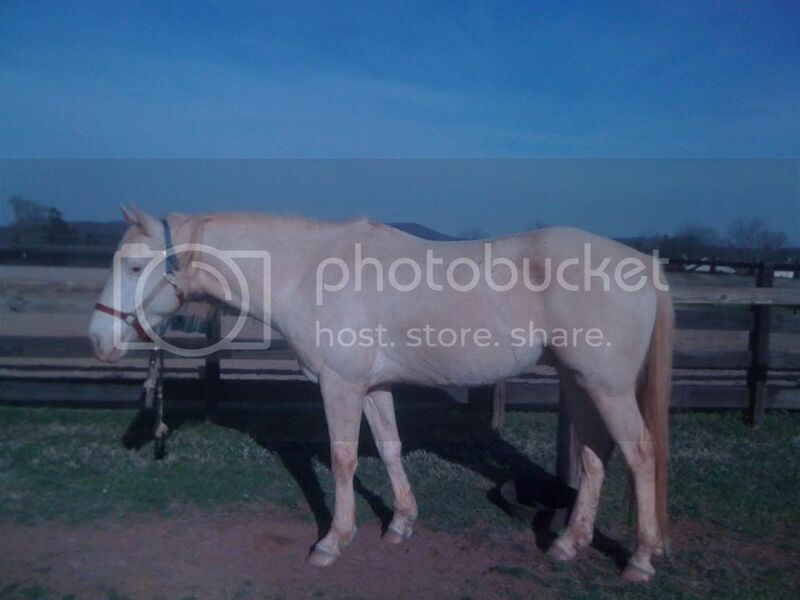 This QH gelding also has very good length to his humerus bone at about the same 64%. Its orientation is identical to our stallion, except that we know this horse is not standing with his front legs properly underneath himself. If he was, then his humerus would be a bit more vertical than our first horse. However, paired with a slightly more laid back shoulder (and the same closed shoulder angle) these two horses should move in the same general manner with their front legs. This horse has the longest humerus bone of the group at 67%. He also has the most vertical orientation of the lot and with the most open shoulder angle. Coupled with his upright shoulder and surprisingly this horse has the potential to bring his knees up the most and fold his lower leg the tightest of this group, as well to have very good scope and potential for lateral movement. Though he should have more expression to his gait than the first two QH’s, I’d bet my own money (again) that he moves in a typical QH fashion, flat and short. I’ll talk about why in a future article. Another long humerus bone at 60%, with a vertical orientation between that of the QH stallion and the grey QH, paired with an all-around shoulder slope of 50 degrees and adequate shoulder angle gives this horse middle of the road action (neither daisy cutter nor hackney) and scope. 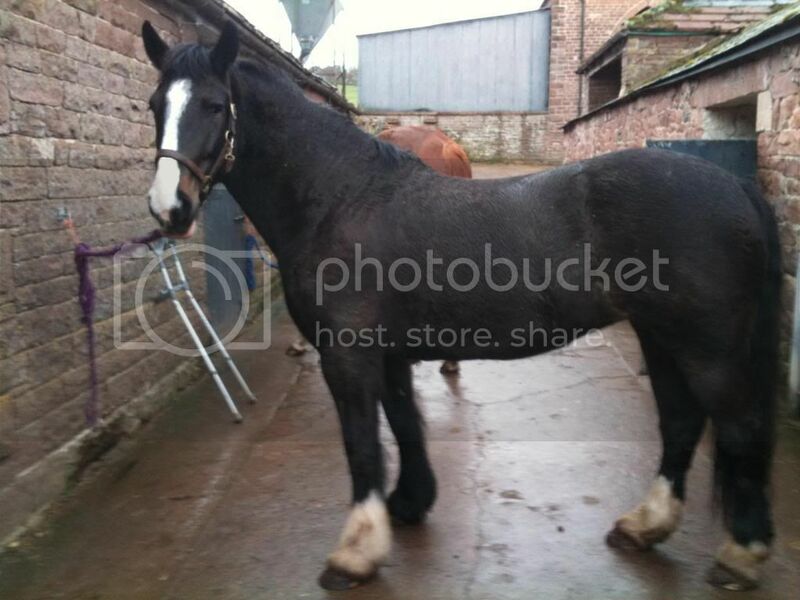 We’ve won the lottery as here is another horse that still maintains a long humerus at 59%. The orientation is identical to our Arabian, but with the more upright shoulder we should expect our TB to be able to lift the knee a bit higher, but the lower leg no tighter due to shoulder angle and humerus bones length being very much alike. Both horses should possess similar scope and lateral potential. Our Paint mare has the shortest humerus of the group at approximately 55.5%, which still makes it long enough but she will have the least scope and lateral movement of all of our horses. Unfortunately it’s also the most horizontally placed on a quite upright shoulder. Still she manages to keep a minimum 90 degree shoulder angle. While it’s a desirable trait to have a long shoulder, this horse has too much shoulder length placing the point of shoulder too low. This low placement puts a horse more over its shoulder and onto its front end. Horses of this construction tend to be forever pigeon-breasted. She’s a contradiction. The upright shoulder says she can bring the knee up, but the horizontal humerus says she can’t. The humerus bone wins every time and so a horse constructed like this will lead with its chest when it jumps and hang its knees all day long, every day. This entry was tagged conformation, humerus, shoulder angle, shoulder slope. Bookmark the permalink. I find that applying the science to horses I know drives home the lesson. I know their movement, strengths and weaknesses and adding the why of it all completes the puzzle for me. It’s also fortunate that I don’t ride at a level that needs perfect conformation to succeed. My horses fit in with the upper 5 of this post – strengths and weaknesses with more quality than the Paint mare, thankfully. 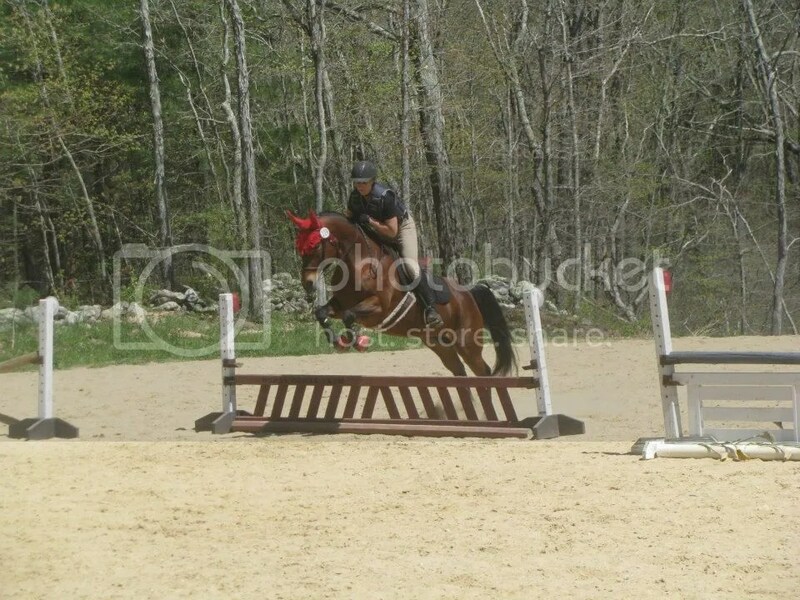 My most athletic is a little QH mare. She took to jumping like a fish to water, is confident and appears to like the challenge – she’s a thinker. She’s always tidy with her front but I realize that she is tight below the knee and that the knee itself isn’t anywhere near horizontal. I marked up a confo shot of her, below, and was surprised that her humerus is more vertical that I expected. I thought it would be flatter which would explain her knees being low. She also appears to have a humerus well over 50% of her scapula. 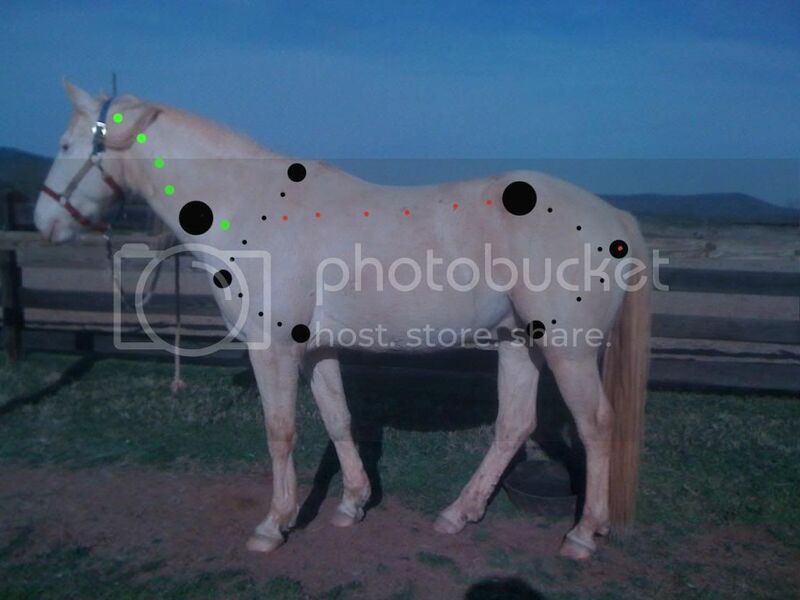 I don’t have a protractor with me but her shoulder is slightly closed if I’ve hit the marks, which is typical in my barn of stock horses. Have I missed the mark of her point of shoulder? I know the photo is dark which doesn’t help matters. Remember we’re always talking ‘potential’ of the body and the horse. Lots of horses never reach their potential, not in movement, not in athletic ability. How a horse is ridden, how it’s trained, how it’s managed, and how healthy it is all either moves a horse towards its potential or away from its potential. Let’s just look at your jumping photos as an example. 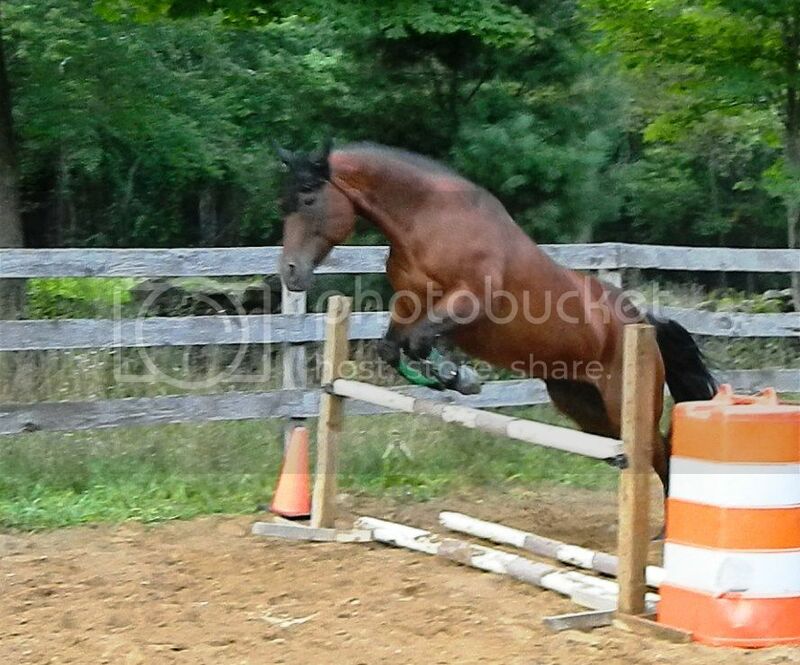 In the free jump picture your horse has chipped in and because of that she’s not been able to use her body to its full potential. Because she’s honest in her task, rather than just simply stopping, running out or going through the jump she’s thrown herself over the jump by leading with her shoulder. As a result her knees have badly hung. What saves your horse in this instance is that she has a very well-structured neck, placed superbly on her shoulder with a very clean shoulder bed, allowing her to use it exceptionally well and aid her over the jump. Look at how loose the underline skin is of the neck. She’s raised her base of neck, in turn lifting the wither and everything else that follows because of that action. Moving onto the warmup jump, you can again see how she’s raised her base of neck like a champion, even better than in the first photo (for obvious reasons like getting to the jump at a better distance). The tubular complexus muscle is evident its entire length. We can see quite a difference in those front legs in terms of the knee being brought up just by a good takeoff point vs a less desirable one. Imagine then all the other ways a horse’s movement (or jumping style) can be affected; unbalanced riders, head and mouth being jerked coming into the jump as we so often see, and what about unhealthy muscles – stiff, over worked, inverted from regular hollow movement, uneven from one-sidedness and crookedness, over developed and under developed muscles caused by martingales, side reins, draw reins and the like… Soft tissue health (or illness), is one of the biggest factors in horses reaching their potential or not, and is probably the most overlooked. I’m not entirely convinced that you’ve got the point of shoulder right. I want to say that it is lower, which would make the humerus more horizontal and shorter, but only a better picture or palpation on your part can confirm or deny that. Her shoulder angle is closed a bit in this photo, but she’s standing with her front leg too far underneath herself and I question the levelness of the ground she’s on. If the angle is closed, then it’s only closed by a degree. I suspect, though, that her correct resting angle is right on 90 degrees. 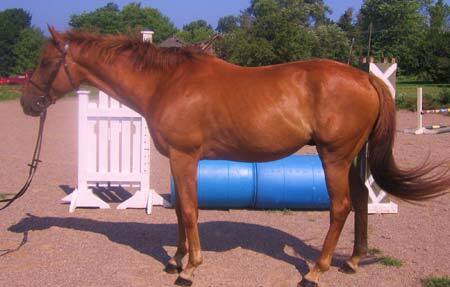 The orientation of the humerus bone (taking into account her stance) appears to be similar to our Arabian stallion and TB gelding. Her shoulder slope is the all-around 50 degrees. Taking everything into account, she jumps just as I’d expect her to; hangs her knees a bit and while tidy below, not super tight. Well, Merc, is looks like I’m the only one who didn’t understand the humerus! Must be the hair….. I think you understood it just fine. It’s just not as controversial a topic as Rolkur. I’ve found these confo things really interesting and useful – I tend to be able to look at a horse and go ‘thats really nicely put together’ from an instinct point of view but have no idea of the details and why certain things are good. Okay, I marked her up for you. This is a great photo because you can easily see the point of shoulder and you can almost see the entire scapula shadowed in her coat/skin. She’s quite upright in the shoulder at a 57-58 degree slope. This gives the most potential for knee lifting ability. Her humerus is 55% the length of her scapula and would be a bit more vertical if she was standing with those front legs out a bit more. I think her point of shoulder is a tad on the low side and that’s why you’ve often seen her stand a bit too underneath herself in front. Her shoulder angle in this photo is right on 90 degrees, but again, if she stood with her leg properly underneath her she’d have a more open shoulder angle – which is a good thing. Taking everything into consideration, this horse should have plenty of natural knee action and have better jumping form over fences than blondemare’s mare – getting knees higher, however, it wouldn’t surprise if she also jumped occasionally by leading with her shoulder and hanging her knees when not properly prepared, when startled by the obstacle, when too heavy on the forehand, or otherwise unbalanced because of that lower point of shoulder. She does appear to be quite loose and flexible through the shoulder and elbow, so that would also bode well for knees up and lower leg folding. 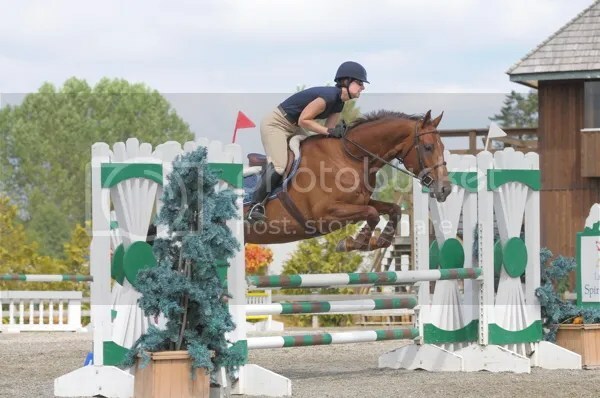 Because the humerus isn’t particularly long and not as vertical as it could be to open the shoulder angle more, she’s not knees to ears, but then she’s not a GP jumper anyway. She should have plenty of form to be safe over all those stone fences and such on your regular hunts. 🙂 Am I right? Let me go fix that…I was being pressured by the spouse to hurry up when I was typing that. 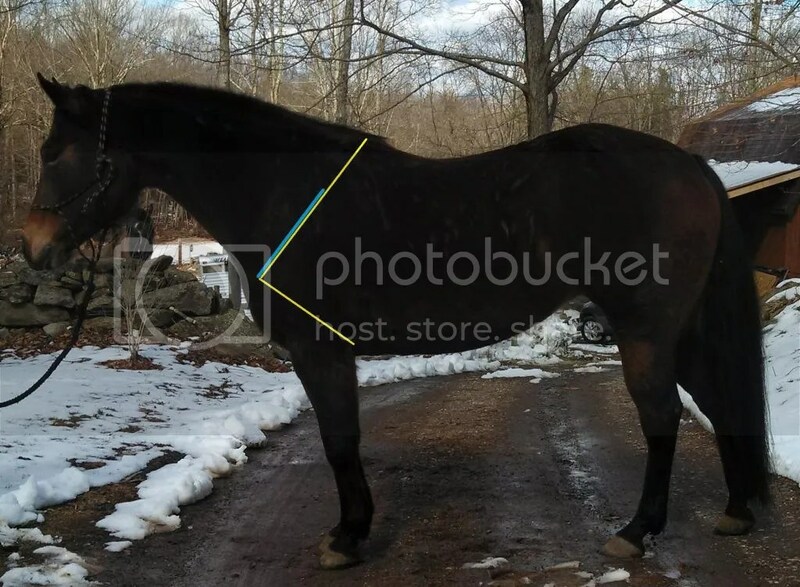 Was poking around “Sporthorse Conformation” and the author states that an overly long humerus, just like a too upright shoulder, may cause the horse’s front legs to stand too far underneath the horse. Nutmeg’s mare has dissed the theory of the long humerus causing this quite clearly. The author also states that “the desired angle is 90 degrees or less…a smaller angle is preferred over a larger one…most of the time a larger angles goes along with a somewhat upright shoulder, which decreases range of motion and shock absorption”. My head hurts. The illustration shows a longer humerus on a more sloped shoulder and the short humerus on a straight shoulder. It seems contradicting. Horses stand too far underneath themselves for a lot of reasons, but not because the shoulder is too upright or because the humerus is too long. 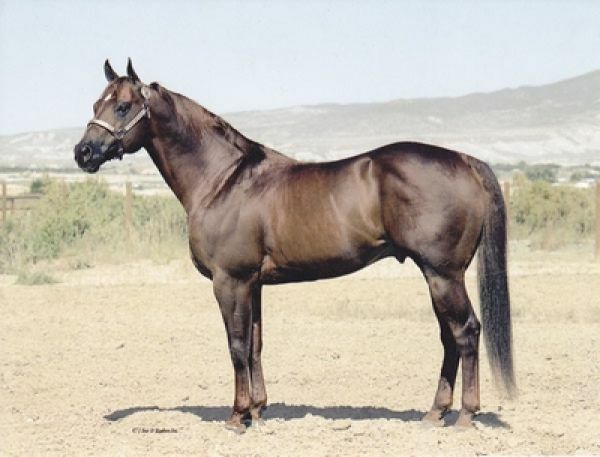 There are plenty of horses with upright shoulders and closed shoulder angles, just as there are plenty of horses with laid back shoulders and open shoulder angles. The decrease of shock absorption is from the upright shoulders, but the decrease in range of motion is all about the closed shoulder angle and/or a short humerus and/or a horizontal humerus. 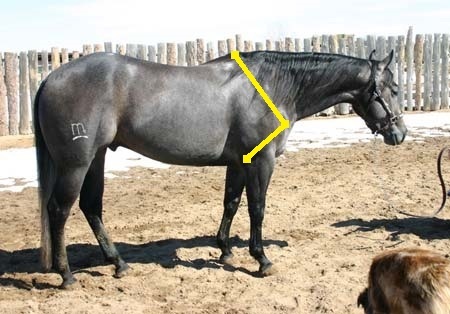 The number of combinations of shoulder slope, shoulder angle, humerus length and humerus orientation (very vertical to very horizontal and everything in between) is just about limitless in the horse. All you need to remember are the two basic rules about shoulder slope in terms of whole limb movement, the four basic rules about the humerus bone from this article that dictates the knee height and lower leg folding ability, and that anything less than 90 degrees for a shoulder angle is bad for the horse. If you think your head hurts now, just wait until we get to hind leg bone ratios and total hind limb length. Finally, stop reading those crap conformation books. The only ones you need to read are Deb Bennett’s. 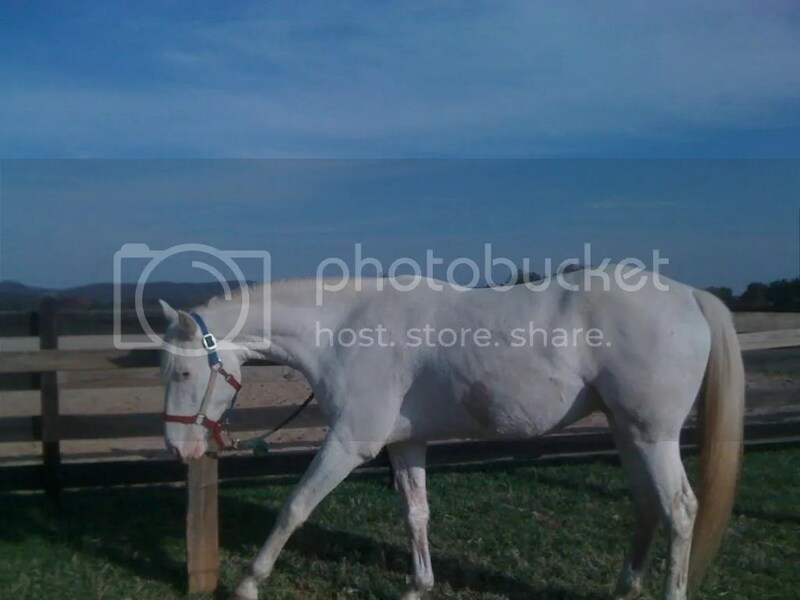 Ooh if people are posting their own horses… here’s mine. This pic is a couple of years old and she’s in foal in this picture, but I haven’t taken many tack off, standing still photos. And here are a couple of more recent action pictures. I like the science of these posts too. I know that my mare has the ability jump correctly despite my less than stellar equitation (that’s why I bought her) but it is interesting to understand exactly what about her makes that possible. Okay, so here’s another with an upright shoulder, a long humerus and a shoulder angle right about 90 degrees. As a result she brings her knees up enough to make her forearms parallal with the ground and is neat and tidy with the lower leg. She’s not a knees to ears jumper, though, because the humerus bone is not vertical enough, her shoulder angle not open enough. She also carries (technically) a too high knee for a jumper, the cannon bone too long. All are always welcome to put their own horses up for discussion at any time. I do prefer, though, that the owner try to analyse the trait/traits prior or to ask specific questions about a trait/traits. Thanks. 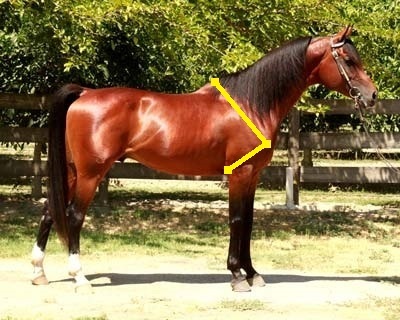 The shoulder part is right on to what I had concluded myself, but I appreciate knowing I was correct (my concern when looking at my own horse is that I’m reverse-engineering; in this case, am I seeing the shoulder as 90 degrees because I’ve already seen the photos with the parallel forearms). I thought these photos made for a good example of performance compared to conformation. Rascal is 4 1/2 in the first photos (dirty and white lead line) and 3 yrs 3 mos in the picture with his foot stretched out (less dirty and green lead line). Note how lowering the head lowers the spine overall, how raising the base of the neck while lowering the head levels the spine somewhat, and while bad neck posture, broken back a little, having the head/neck up raises the base of the neck. Note the change to the shoulder by changing the leg position. Looking back reminds me I haven’t taken any pictures of him in more than six months. I need to snap a few shots. Can you use these sorta of things on foals or do they need to pretty much grown? Many of the angles are fixed on a foal old enough to be up and moving, not a new born, they are stretching out from fetal position. But the overall body levelness, ie, base of neck to LS joint, hip angles, shoulder angles are pretty much fixed. What can change is the proportion of bone lengths somewhat as the lower leg bones are pretty much set within a few months of birth, 75-80% of adult total leg length is set at birth and pretty much completed growth around 30 mos. 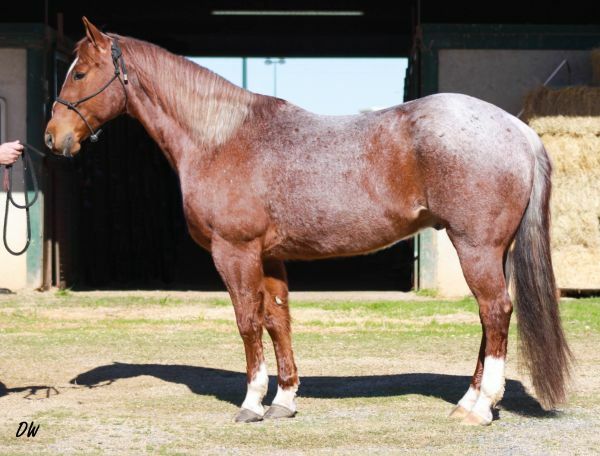 but can be delayed slightly in a larger breed, shortened slightly in a small breed, mares tend to reach height slightly sooner than geldings, etc. Some of the bones higher up, such as shoulder, humerus v. scapula, the humerus will stop growing sooner than the scapula, so total bone length proportions will change. Hence a foal is leggy, the younger it is the more the cannon will be long in comparison to the radius and then the proportion will ‘improve’ as the radius continues to grow. Colts are leggy looking until shoulder and hip grows out giving more of total adult height to the body than in the foal. Spine finishes last, so the horse will be longer when it finishes growing and its withers will generally be more prominent. Last month or July, can’t remember which, Mercedes did a blog on assessing youngsters and covers this thoroughly. I was having trouble measuring, my eyes aren’t what they used to be, but sloper 56-give or take a degree and angle at 89-90, humerus close to 2/3 the length of the scapula (which could still be changing on a growing horse) and a fairly upright slope to the humerus. If he didn’t have wussy front legs, he could jump ok. He looks like a rascal!!! He has that “I’m going to find trouble” look to him! What is his breeding? I’m guessing you mean Milo? He’s a good natured little monster 🙂 Lots of character and yup is good at trouble. I think he’s pretty well put together but am not used to looking at foallys. He certainly has done pretty well showing over the summer and I’m excited to see what he grows into. 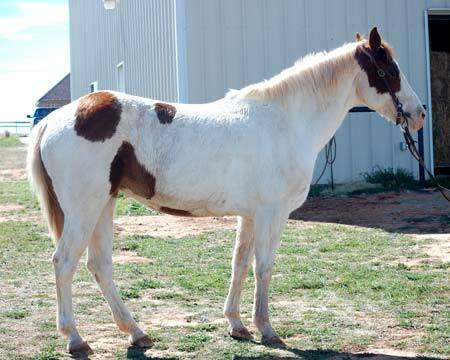 he’s an appaloosa, few spot coat pattern, Ulrich ranch bred stallion, mama , while still a registered app, had more quarter horse breeding, was by Dreamfinder an app halter stallion that was heavily quarter horse. 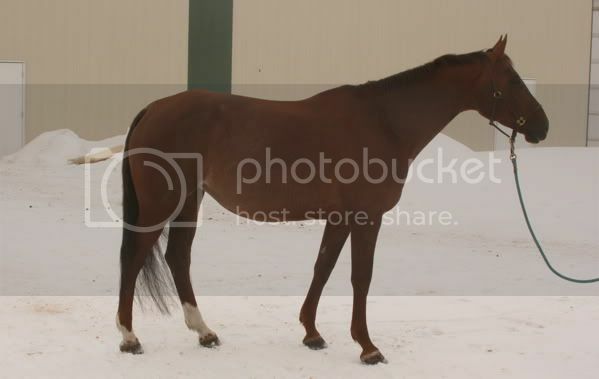 He’s not very halter horse looking though. Most nosey horse I have ever met, escape artist, opinionated, has more scars from picking fights in pasture, because every day is the day he may become herd boss. He challenges a handler the same way. But he can be downright funny, grab a towel on the wash rack after a bath if he wants his face dried, has to play with the halter before you put it on him to leave the stall or he won’t let you put it on him, after he mouths it carefully he sticks his nose in and slides it up his own head. One day it started raining as I put him out to join the herd (stays in during the day because of the pink skin in the summer). Herd headed in under some trees, and he stands at the edge, pulling on the leaves of a tree. There is plenty of grass, so I wonder why he doesn’t just graze. And then I realize he is shaking the tree. Finally the herd boss and one of the other geldings come charging out at him and he runs off with them chasing, which is what he wanted in the first place, to play. The horses were getting wet under the tree and were going to get him for causing trouble. Too funny on the tree shaking! Some are just born to be troublemakers and will do anything for attention. The geldings have oral fixation on everything but my escape artist is a mare. It’s nice to hear that you don’t fall to pieces when he gets an occasional scar, I so love to watch horses play! After I read this post, I looked up the recent Equus articles on shoulders. The article on seeing a shoulder said that while usually you can measure the angle of the shoulder by tracing a line from the point of the shoulder to the middle of the withers, some horses have a shoulder blade that runs in front of that ideal line, further up the neck. The article said this isn’t the best conformation, though didn’t seem to really specify why. When I look at the Paint Mare, I think she is in fact built this way. 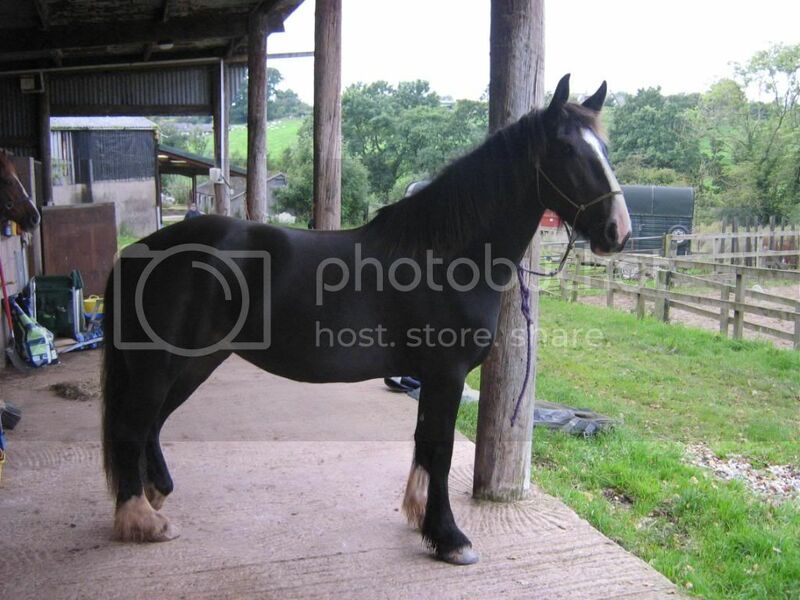 And as she is the primary horse I get to examine and prod, that’s made me a bit confused over how to see the shoulder! Whether you follow the ideal line or the actual line changes how steep the angle of her shoulder is, and how open the arm joint. I’m attaching a photobucket album that shows her in current fit mode, but also as a green broke 5 year old with less muscle. Any thoughts? We have always found her a bit restricted in the shoulder though she has some relatively snappy high knee action at the trot, and can lift her knees OK jumping if she gets the right distance. This link should get you to four photos. I’ve password protected them as Paintmare. First time on photobucket, so if this turns out not to work, I will try again! Yes, I discussed the difference in measuring with another poster in comment section of this article. Basically, I kept it simple for the broader audience. Your link shows that there are 0 images in that album. 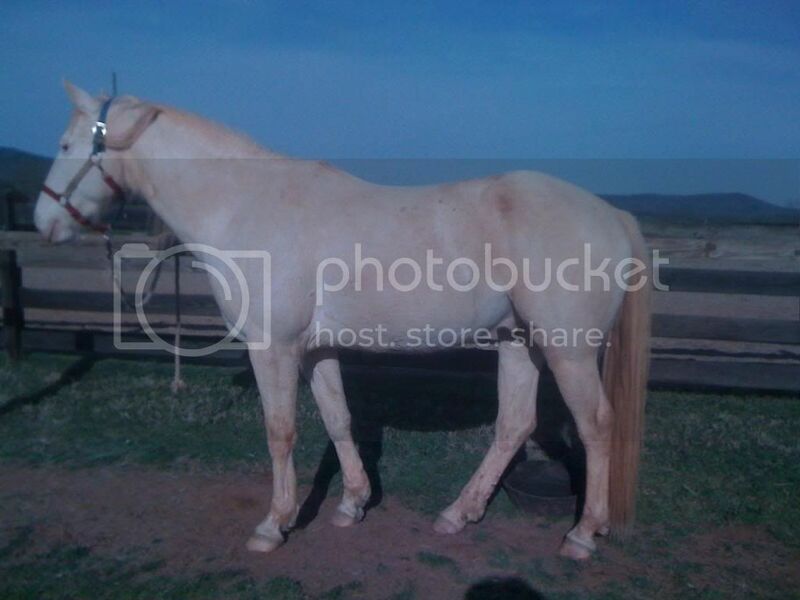 You can always send the pictures to the Hoove’s Blog email addy and I can put them up. I took the password off my photobucket account. If that doesn’t work I will email them as jpgs when I get home. Hoof balance also affects shoulder angles…..upright hooves create reduced foreleg extension and tend to create a choppy gait that resolves when correct hoof balance is achieved.